As an existing Skype for Business customer, your complete transition to Teams might take some time. However, you can begin realizing the value of Teams today, by enabling your users to use Teams alongside Skype for Business. Given that there’s some overlapping functionality between the two apps, we recommend that you review the available coexistence and upgrade modes to help determine which path is right for your organization. For example, you might opt to enable all workloads on both solutions without interoperability. Or, you might decide to manage the user experience, either by gradually introducing Teams capabilities or by targeting groups of users for select capabilities, until your organization is ready to upgrade everyone to Teams. Use the outcome of your pilot to help assess the right upgrade journey for your organization. This article outlines the various modes that enable you to manage which modalities in Skype for Business and Teams are available to your users. As with any deployment, we strongly encourage you to pilot your intended plan with a selected group of users before upgrading your organization to Teams. Remember, introducing new technology can be disruptive for users. Take time to assess user readiness and implement a communication and training plan prior to implementing any of the modes outlined herein. To formally prepare your organization for its journey to Teams, you need to start planning for the upgrade scenarios that will eventually let your organization fully embrace Teams as your sole communications and collaboration solution. When some of your users are ready to use only Teams for their day-to-day communications and collaboration needs, you can start upgrading these users to Teams by enabling Teams Only mode for them. If it’s not feasible for your whole organization to move to Teams, you can start by piloting Teams alongside Skype for Business in Islands coexistence mode. As the additional coexistence modes, (i.e. Skype for Business with Teams collaboration and Skype for Business with Teams collaboration and meetings), are become progressively fully available in the next few months, you can also start by fully adopting Teams as a group collaboration solution first while keeping Skype for Business as your organization’s unified communications solution. That is Microsoft’s recommended path for customers using Skype for Business Server (on-premises or hybrid) and customers with significant complexity whose trajectory to Teams will include a long coexistence period. The following table compares coexistence and upgrade modes. In a direct upgrade journey, you first deploy Teams alongside Skype for Business in Islands mode as part of evaluation and early adoption, and then upgrade your users to Teams Only mode with the goal of quickly retiring Skype for Business from the environment for all users in the organization. This is the recommended journey for Skype Business online customers, unless they are concerned their users will be confused with having two tools to conduct the same action (chat, calling, meeting scheduling). A gradual upgrade journey delivers a specific coexistence and upgrade mode to a specific group of users (also called a cohort), depending on their communications and collaboration requirements. Over time, the entire organization can converge into using Teams Only and eventually replace Skype for Business. However, if your organization has compelling business reasons to keep Skype for Business—such as a dependency on a Unified Communications Managed API (UCMA)–based solution that integrates with line-of-business applications, or an ethical wall solution currently available for Skype for Business only, or a complex Enterprise Voice deployment that will take time to upgrade to Teams Only—you can upgrade a portion of users to Teams Only mode while retaining Skype for Business users in one of the coexistence modes for a portion of your user population. Gradual upgrade journey is the recommended approach for on-premises (and hybrid) customers starting with Skype for Business with Teams Collaboration coexistence mode and moving from there to Teams Only mode when requirement for the users met (possibly through the Skype for Business with Teams Collaboration and Meetings coexistence mode). For both types of upgrade journey, if your organization is currently a Skype for Business on-premises deployment only, you need to start planning to implement Skype for Business hybrid before upgrading your users to Teams Only mode. This will also help facilitate interoperability with Teams. Use MyAdvisor to guide your Skype for Business hybrid implementation. Teams Only mode requires that the users who are part of cohorts be homed in Skype for Business Online, and a hybrid relationship between your Skype for Business on-premises deployment and your Skype for Business Online tenant is required to facilitate the interoperability between Skype for Business and Teams. The move to Skype for Business Online must be completed for users who are part of the cohorts before they’re upgraded to Teams Only mode. Skype for Business Server 2019, and Skype for Business Server 2015 with CU8 update can simplify the mechanics of upgrading on-premises users to Teams by managing the migration to Skype for Business Online and upgrading the users to Teams Only mode in one step. The direct upgrade journey is illustrated in the following diagram. Teams is deployed to all users in the organization and configured in Islands mode. When your organization determines that Teams is ready to fulfill all of your communications and collaboration needs, notify the users and upgrade them to Teams Only mode. At that point, Skype for Business can be retired from the environment. An example of a gradual upgrade journey is illustrated in the following diagram. Teams is deployed in the organization in Islands mode for evaluation and then move to different coexistence and upgrade modes for different groups of users. 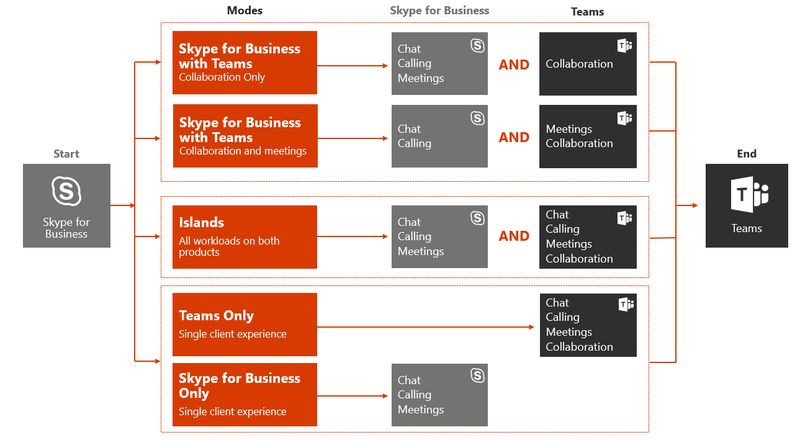 For example, a group of users can be enabled for Islands mode, another enabled for Skype for Business with Teams collaboration and meetings mode, while a third group of users might initially be enabled for Skype for Business with Teams collaboration only mode. Over time, groups of users can be upgraded to Teams Only mode, followed by the rest of the organization. Eventually, the entire organization will be ready to retire Skype for Business and use only Teams for communications and collaboration, or—if business requirements dictate that Skype for Business be retained for a specific group—the majority of users in the organization can use Teams Only. Which upgrade journey is suitable to your organization's business requirements? Identifying your current deployment model, use case scenarios, and key considerations for your organization will inform the journey to Teams that’s best suited to your organization. Which upgrade scenario is applicable to your organization? Decide the timeline of your organization's upgrade journey based on messaging, meetings, and calling business requirements. Decide the required additional work to complete your upgrade journey. After you’ve chosen the best upgrade journey for your organization, perform your upgrade to Teams.